The Solar Dynamics Observatory (SDO) is NASA’s most important solar physics mission of this coming decade. To be launched near the end of 2008, the three primary instruments on board SDO are the Helioseismic and Magnetic Imager (HMI), the Atmospheric Imaging Assembly (AIA) and the Extreme ultraviolet Variability Experiment (EVE). The data will be predominantly used to learn about solar magnetic activity and to probe the internal structure and dynamics of the Sun with helioseismology. The solar scientific community is to be inundated with a flood of large-volume SDO data (about 1 TB/day). 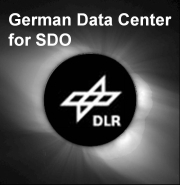 The German Data Center (GDC) for the Solar Dynamics Observatory (SDO), hosted by the Max Planck Institute for Solar System Research in Germany, will provide access to SDO data for Europeans. The GDC-SDO will make available all the relevant Helioseismic and Magnetic Imager (HMI) data for helioseismology and smaller selected Atmospheric Imaging Assembly (AIA) data sets. This project commenced in August 2007 and is funded by the German Aerospace Center (Deutsches zentrum fuer Luft- und Raumfahrt or DLR) until December 2012. Additional information about the GDC-SDO can be found at http://www.mps.mpg.de/projects/seismo/GDC-SDO/index.htm. While the Data Record Management System (DRMS) has been developed and is distributed by the Stanford/Lockheed Joint Science Operations Center (JSOC), there is also the need for an advanced Workflow Management System to process the data at the German site. Pegasus is currently being implemented at the GDC-SDO to run the helioseismic tomography pipeline. This particular workflow will read sets of HMI/SDO images from the local database, remap and track images, apply filters in 3D Fourier space, compute helioseismic travel times, and invert these travel times to form tomographic images of the solar interior. Because the data flow will be continuous, significant compute power will be required. Pegasus/Condor will distribute the jobs on a local compute cluster (~150 cores) and, later, on remote grids. Langfellner, J., L. Gizon, and A. C. Birch. “Spatially resolved vertical vorticity in solar supergranulation using helioseismology and local correlation tracking.” Astronomy & Astrophysics 581 (2015): A67.